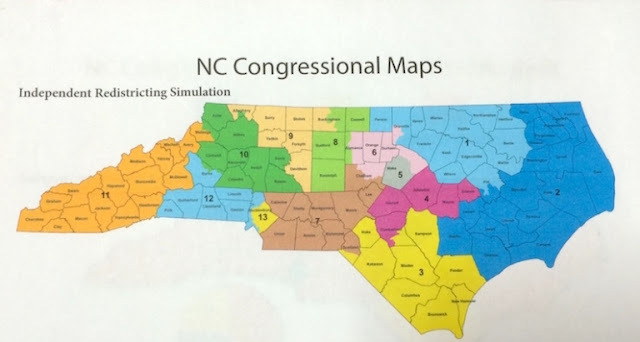 An example of what an independent redistricting commission might come up with. The above simulation was completed by ten retired state supreme court and appellate justices in conjunction with Common Cause North Carolina and the Duke University Sanford School of Public Policy. This redistricting "commission" ended up with six districts leaning Republican, four leaning Democratic, and three considered toss-ups. “No district was drawn to favor a party, a member of Congress, or to dilute the voting strength of minorities,” said Tom Ross, a former UNC System president and now a distinguished fellow at the Sanford School. Nor did the mapmakers use voting history or registrations to draw the lines. I have always been in favor of an independant drawing of congressional districts. The draft you show is so much better than anything either political party can, or is willing, to draw. Unfortunately, I don't think this will ever happen; I don't think either polical party is willing to give up the ultimate perk of legislative control. Wouldn't elections be exciting in those toss up districts?